the timescale has changed - non-members wanting to use the new digital entry process need to note that digital submission closes on 15th January. The Annual Exhibition will be in the Aldersgate Room of Central Hall Westminster, Storey’s Gate, London SW1H 9NH between 15th and 23rd April 2016. There are a number of prizes (I got an Hon.Mention last year on one of them!) plus eligible works can be considered for a Certificate of Botanical Merit which is usually assessed by a botanist. What follows is my overview and digest of the terms and conditions of entry for the 2016 exhibition. You can the digital entry form and more information on this page on the website. 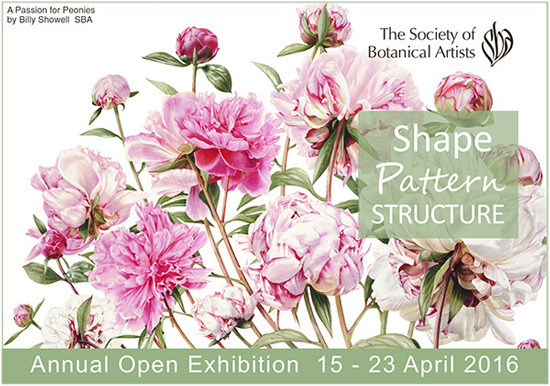 Please note that any errors of interpretation are mine and that all those submitting to the exhibition should rely on the formal SBA paperwork not line! There are no constraints on age or where you live with respect to who can enter. Every year, the exhibition includes artwork from international artists. Application for membership via exhibition: There are special conditions for those wanting to apply for membership or associate membership and details of these conditions can be found on the second page of the Terms and Conditions leaflet. To become an Associate member, an artist must establish a record of accepted work showing a consistent standard: the minimum period required to establish this record is two years which means that the artist must have submitted five works and had ALL five works accepted for two consecutive years: that is ten out of ten works accepted in total over two successive years. The Society will not take responsibility for payment of any importation charges or duties. Artists who are not normally resident and taxable in the UK can submit work but will need to register for VAT if the work sells at the exhibition. For those unfamiliar with the process this is my blog post about VAT for non-UK artists and UK exhibition organisers. All work entered must be for sale - so don't enter anything which you want to hang on to for another exhibition! You won't get any physical work back until 25 April irrespective of whether or not it is selected for the exhibition. All work must be completely original and produced by the person who signs the submission form. Any copies of any work of any other artist, either living or dead, could result in prosecution. 3d Works: sculpture, , glass engraving, ceramics, jewellery, carving, metal-work, etc etc. Media excluded: No photography or digital work will be considered for the time being. The expectation is that all work will be presented in a professional manner. The detailed requirements can be found in the terms and conditions in the section on Presentation and labelling of work. To enter you need to submit the work, the entry schedule and a fee. The SBA had have had - until this year - a very complex system of fees - for entry and hanging with variations in what was charged depending on the size of the entry and what was accepted for exhibition. It must have been a nightmare to administer! Last year the SBA introduced a minimum price for artwork above a certain size. This continues this year. I assume the objective is to eliminate medium/large works with low prices - which are inappropriate in a London exhibition. The minimum price of £350 does not apply to hanging work measuring less than 15" on the longest length of the frame, or to miniatures, 3D-work or etchings. If an artist is personally registered for VAT, then the VAT due on the selling price of the works should be included in the catalogue price. A non-refundable digital pre-submission fee is £15 per work, payable on line on submission. 42 per cent on ALL work related to the exhibition i.e. There are major benefits for international artists if they can get the work to the UK and framed for the Receiving Day after the results of the digital pre-selection are announced on 31 January. What type and size of image? SBA 2016 Receiving Day is 22 February 2016. Entries will be booked in at the Aldersgate Room at Westminster Central Hall. The SBA provides a list of couriers you can use. Couriers bringing multiple works will be allowed to unpack in the Gallery. 25 April 2016 Collection of unaccepted and unsold work from Aldersgate Room, 10am to 3pm. Artists must bring their own packing. Note there is only one collection date for both unsold and unaccepted work. Hence the advantage of using the digital selection process if there are other places you'd like to show your work. Note that the General conditions of entry provide the name and contact details for Mrs Pamela Henderson, Executive Secretary SBA who looks after a lot of the entry process. Any queries should be addressed to her.